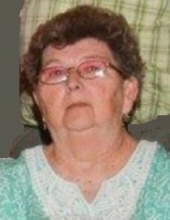 Mrs. Marilyn Nadine White of the Glenview Community of Green County, Kentucky, daughter of the late Ruel Thomas Judd and Iley Uvada Kidwell Judd, was born on December 15, 1942 in Green County and departed this life on September 14, 2018 at the Signature of Hart County Nursing Facility in Caverna, Kentucky. She was 75 years, 8 months, and 30 days of age. She had made a profession of faith in Christ and was a member of the Oak Grove Separate Baptist Church. She was also retired from Fruit of the Loom having worked as an inspector for 33 years. Survived by her husband of 57 years, Vernon Wallace White, having united in marriage on June 3, 1961. Other survivors include one son and a daughter-in-law: Gary and Linda White of Ohio; one daughter and a son-in-law: Stephanie and Mike Toy of Paris, Kentucky; three grandchildren: Reece White of Fort Collins, Colorado, Megan and Ryan Nave of Gratis, Ohio, and Chelsie and John Sudduth of Frankfort, Kentucky, Special friends: Gary and Sally Conrad and a host of other relatives and friends. The funeral services for Mrs. Marilyn Nadine White will be conducted at 1:00 P.M., Central time, Monday, September 17, 2018 at the Oak Grove Separate Baptist Church with burial to follow in the Oak Grove Cemetery. Bro. Larry Wisdom, Bro. Ricky Arnett and Bro. William Davenport will be officiating. Visitation is requested from 4:30 P.M. until 8 P.M., Central Time, Sunday at the Cowherd and Parrott Funeral Home and after 10 A.M., Monday until time of the funeral service at the Oak Grove Separate Baptist Church. The family has asked that expressions of sympathy take the form of donations to the Oak Grove Cemetery fund, which can be made at the funeral home. To plant a tree in memory of Marilyn Nadine White, please visit our Tribute Store. All times are central times. "Email Address" would like to share the life celebration of Marilyn Nadine White. Click on the "link" to go to share a favorite memory or leave a condolence message for the family.